In partnership with K6 Design Group, Jofemar and SV365 Technologies, customers of the world’s premier jeweler and specialty retailer can now purchase the new Tiffany perfume from a luxury vending machine at Tiffany & Co in its new boutique in Covent Garden London using a quick and easy chip and pin transaction. Founded in New York in 1837, Tiffany & Co. is the world’s premier jeweler and American house of design. Its London boutique features a fragrance kiosk from which customers can now – thanks to the introduction of Worldline’s VALINA – purchase luxury goods through any form of payment. 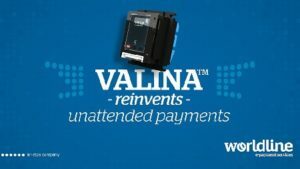 Worldline’s VALINA is the world’s first Android-based all-in-one payment terminal for contactless, chip and mag stripe transactions. It fits any parking machine, petrol station or other EVA-compliant terminal, making it easy for merchants to use value-added business applications, such as NFC loyalty, couponing, and wallets.